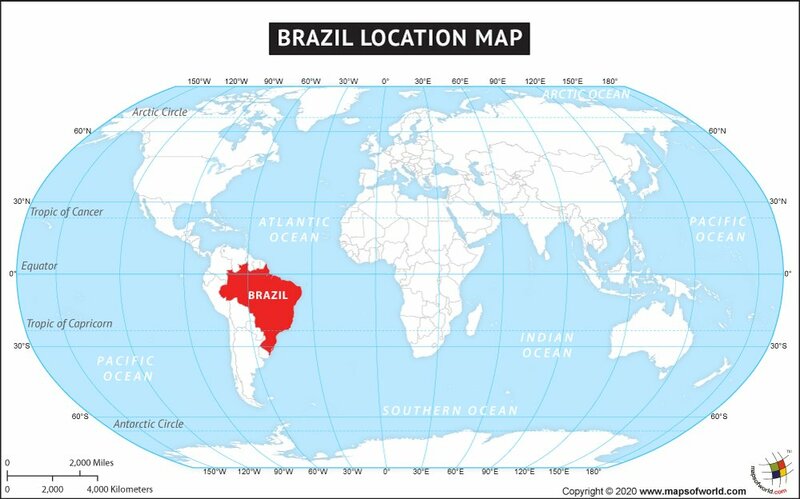 Discription:World map showing where is Brazil located in the World. The largest country of South America, Brazil officially the Federative Republic of Brazil is one of the most diverse tropical countries of the world. Located in the eastern part of South America in the Western Hemisphere, the colorful Brazil is bordered by nine countries and one French Overseas territory namely French Guiana, Venezuela, Guiana and Suriname in the North, Colombia in the Northwest, Paraguay and Argentina in the Southwest, Uruguay in the South and Peru and Bolivia in the West. Chile and Ecuador are the only two South American countries not sharing any boundary with Brazil. Brazil has coastal boundary with Atlantic Ocean in its east. The Geographic Coordinates of Brazil is 15.7833° S, 47.8667° W. Sao Paulo is its largest city and Brasilia is the capital city of the country. The sheer geographic size of Brazil is breathtaking with a total area of 8,514,877 sq. km Brazil is also the fifth largest country of the world. The largest drainage basin of the Amazon River lies in Brazil and it is home to one of the largest wetland of the world, the Pantanal. Broadly Brazil can be divided into five regions Amazon rainforest region, northeastern region, central region, southeastern region, and the southern region. Each region has varied landscape and climate. In fact it is the diverse culture, different landscape and ancient history of Brazil that makes the country fascinating for its visitors.